I've been thinking about block printing and stamping for some time, but during the school year, it's hard to justify spending the time and money to take up such a hobby. Now that it's summer, though . . . . 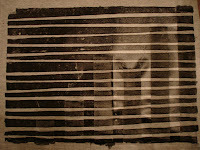 I read a great book about stamp carving called Art Stamping Workshop by Gloria Page and I was really inspired by the idea of using inexpensive objects to create unique prints. It took me a while to decide on a design that was interesting but simple enough for my first effort; it took me even longer to decide how to bring it to fruition. I decided to purchase black screen-printing ink and a small soft-rubber brayer to roll the ink on my stamp. Since these items were a little pricey (and I had no idea if this would even work), I decided not to buy carving supplies and a rubber block to create a stamp on. Instead, I decided on a 12" x 18" sheet of craft foam to cut my stamp shapes out of (at 99 cents apiece it's hard to go wrong) and a rectangle of corrugated cardboard to mount the foam on. 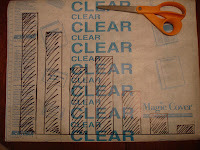 I also bought clear adhesive-backed vinyl (like contact paper) to create a stencil of sorts. 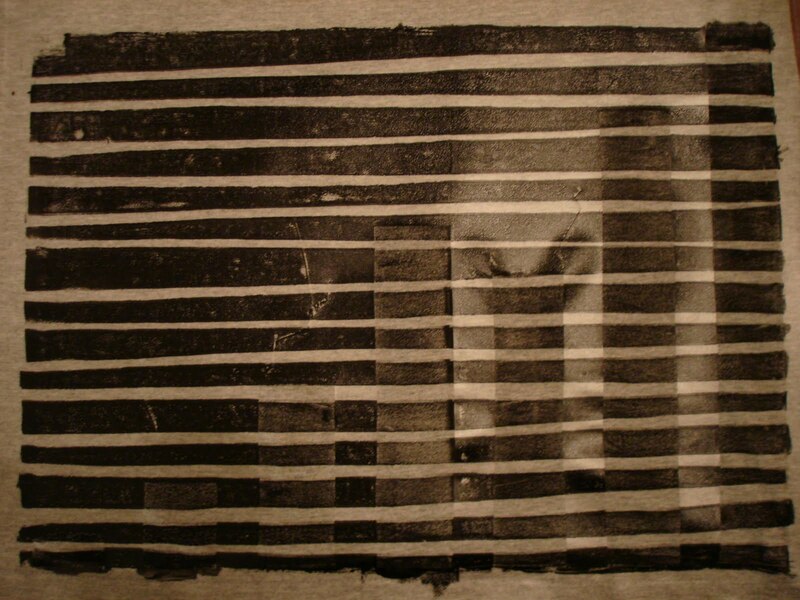 I decided to make my first print on a gray, cotton t-shirt I bought at the Salvation Army. 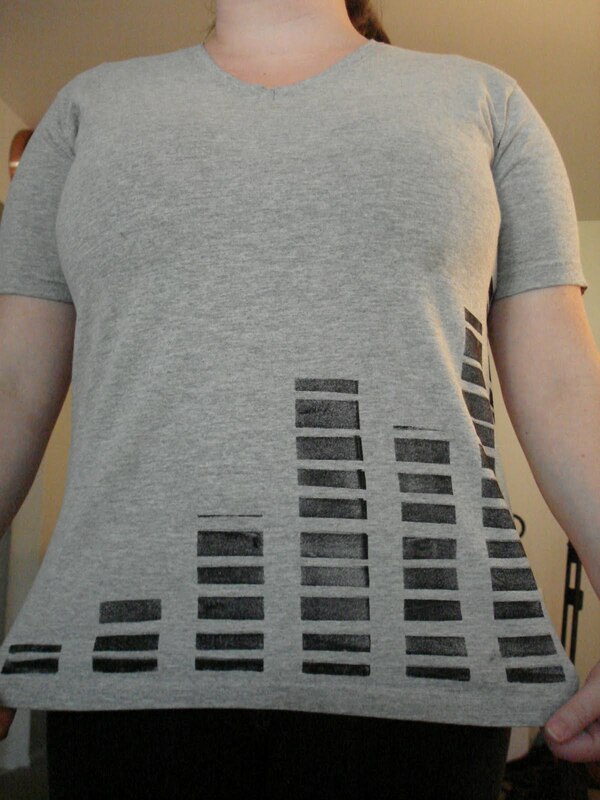 I measured the shirt and cut out an appropriately sized rectangle from the paper-backed vinyl. 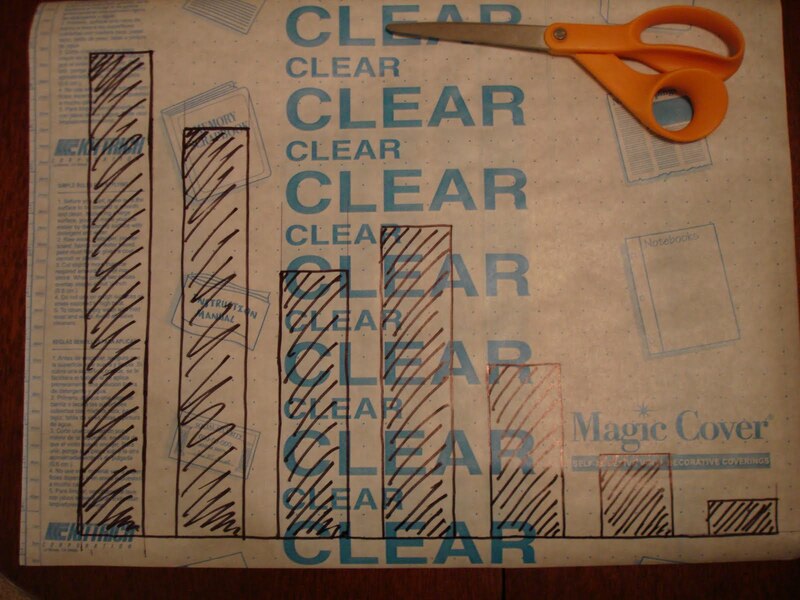 I drew my design on the paper backing, keeping in mind that the sections that I cut out would allow ink through (the open sections would create the printed design). Also, the drawn design is a mirror image of what will actually be printed (since the paper backing will be peeled off and the vinyl will be flipped onto the fabric). I kept my design simple, cutting out rectangles of varying heights. 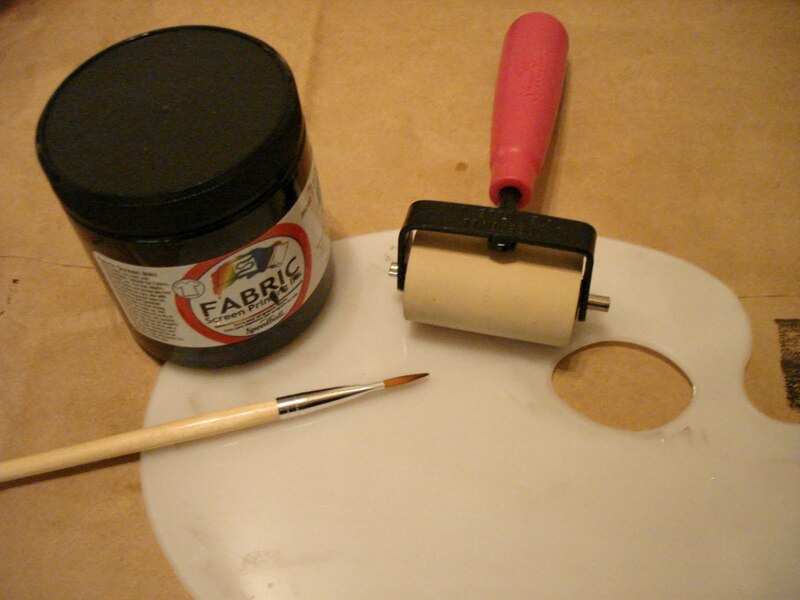 When my stencil was complete, I peeled the paper backing off and placed it on my clean t-shirt. I put newspapers inside the shirt to prevent the ink from bleeding through to the back layer of fabric. Once the stencil was complete, I started creating the actual stamp. I cut a piece of cardboard to the necessary size to cover my stencil. 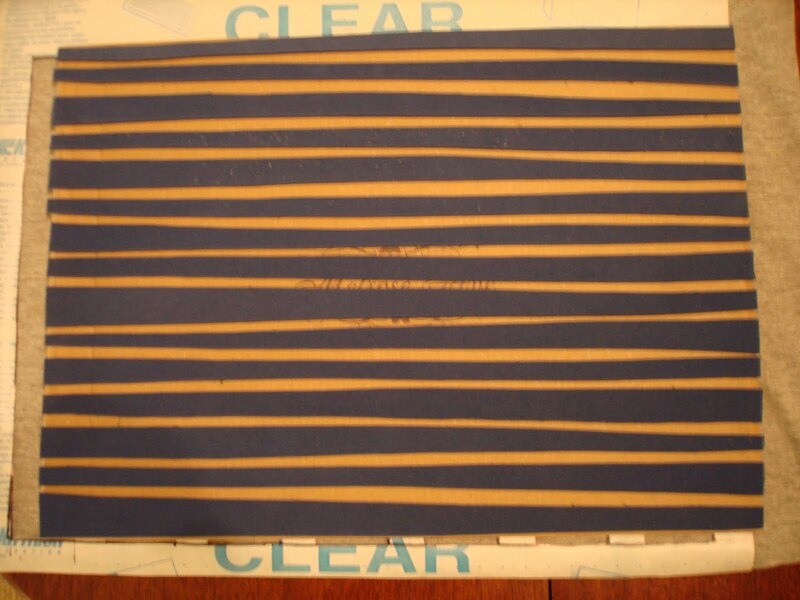 Then I cut my desired shapes (basically just tapered lines) out of the craft foam and mounted them on the cardboard using spray adhesive (see photo to left). 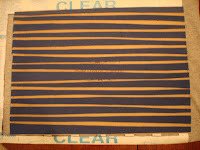 I put a dollop of printing ink on a painter's palette and inked my brayer. Then I rolled ink on my stamp. The foam seemed to absorb quite a bit of ink, so I was pretty generous. When the stamp was inked, I lined it up as carefully as I possibly could over my stencil and lowered it into place. Obviously, once it's down, it's down and there is no readjusting the placement of the stamp. I was sure to thoroughly press and rub the back of the stamp to make sure ink transferred onto every portion of my design. Then I held my breath and pulled the stamp off, taking care not to accidentally drop the stamp onto my just-inked design (see photo to right of inked design before stencil was removed). I was really happy with the way my print turned out. Once the design was dry, I followed the instructions on my bottle of ink to heat set the design with an iron (I spread some scrap muslin over the design and pressed it for about four minutes per side). Now that I have a little more confidence with printing, I would like to try carving a reusable stamp out of a block (almost like a giant eraser designed specifically for this purpose). 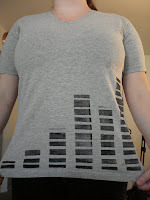 I may look for some sort of medium to add to the fabric ink to get a little smoother print next time. I am excited to try new designs with new materials, and hope maybe you will too. Be creative and enjoy!